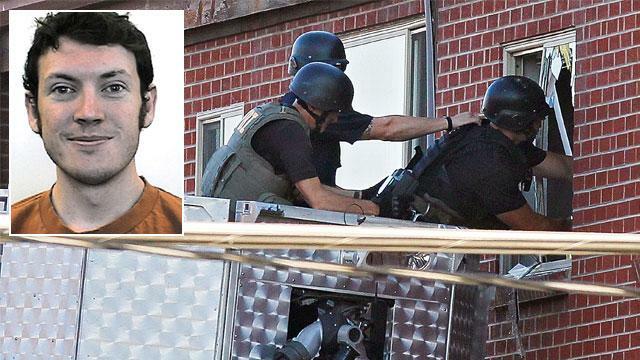 The suspected "lone-wolf" shooter of the Batman movie theater massacre in Aurora, Colo. earlier today has been identified as PhD student James Holmes, who recently withdrew from his neuroscience studies at the Univesrity of Colorado before shooting up "The Dark Knight Rises" screening. Holmes, 24, moved to Aurora to pursue his PhD at the University of Colorado medical center, living just blocks from the hospital in an apartment that is now laced with explosives and being searched by Haz-Mat teams. Holmes killed at least 12 people and injured as many as 50, including U.S. military members, during the midnight premiere of the movie at the Century 16 Movie Theaters in Aurora early this morning. He barged into the theater mid-show, setting off smoke bombs and stalking up and down the aisles firing as many as four weapons at viewers. He was captured by police in the parking lot while still wearing a bullet-proof vest, riot helmet and gas mask. Federal law enforcement sources tell ABC News that Holmes bought a ticket to the movie, slipped out of the theater once it began and propped open the emergency exit before gathering his weapons and gear and coming back into the theater. Once inside, he opened fire. Moviegoer Christopher Ramos today recalled the real-life horror of the midnight premiere of the latest Batman movie, "The Dark Knight Rises," in Aurora, Colo., as a gunman decked in riot gear set off smoke bombs and opened fire on the unsuspecting audience. "People were running everywhere, running on top of me, like kicking me, jumping over me. And there were bodies on the ground," Ramos said. "I froze up. I was scared. I honestly thought I was going to die." "The image in our heads is stuck in there. I still have the ticket right here and honestly, I'm never going to forget this night at all. Because it was the first time I saw something that was real. Like a real-life nightmare that was there, not dreaming of," Ramos told ABC News today. Holmes was caught by police in the parking lot of the movie theater shortly after the shooting still dressed in his riot gear, an outfit eerily similar to a villain in "The Dark Knight Rises." He warned police that his Aurora apartment was booby-trapped, leading police to evacuate the apartment complex. They were working this morning to gain entry to and diffuse the apartment, which they said seems to be "elaborately" rigged with explosives. "The pictures we have from inside the apartment are pretty disturbing considering how elaborate the apartment is booby trapped," police said outside of the apartment complex today. The "flammable and explosive" materials could have blown up Holmes' apartment building and the ones near it, police said. "You just smelled smoke and you just kept hearing it, you just heard bam bam bam, non-stop. The gunman never had to reload. Shots just kept going, kept going, kept going," one witness told ABC News. "I'm with coworkers and we're on the floor praying to God we don't get shot, and the gunshots continue on and on, and when the sound finally stopped, we started to get up and people were just bleeding," another theatergoer said. A San Diego woman identifying herself as James Holmes's mother spoke briefly with ABC News this morning. "You have the right person," she said. "I need to call the police," she added. "I need to fly out to Colorado." The woman and her husband later released a statement saying their "hearts go out to those who involved in this tragedy and to the families and friends of those involved. We are still trying to procss this information and we appreciate that people will respect our privacy." Holmes was wearing a bullet-proof vest and riot helmet and carrying a gas mask, rifle, and handgun, when he was apprehended, according to police. Federal Alcohol, Tobacco, and Firearms sources told ABC News that agents will begin tracing an assault rifle, shotgun, and two handguns used in the attack. As he was taken into custody, Holmes mentioned having "boobytrapped" his apartment with explosives stored, leading police to evacuate his entire North Aurora apartment complex and search the buildings early this morning. The highly-anticipated third installment of the Batman triology opened to packed auditoriums around the country at midnight showings on Friday morning, and features a villain named Bane who wears a bulletproof vest and gas mask. Trailers for the movie show explosions at public events including a football game. Though many moviegoers dressed in costume to attend the opening night screening, police have made no statements about any connection between the gunman's motives and the movie. Police in New York have intensified security around showings of the film throughout the five boroughs today, with police commissioner Ray Kelley saying that "as a precaution against copycats and to raise the comfort levels among movie patrons in the wake of the horrendous shooting in Colorado, the New York City Police Department is providing coverage at theaters where the 'The Dark Knight Rises' is playing." The Paris premiere of the movie has been cancelled in the wake of the shootings. "Warner Bros. and the filmmakers are deeply saddened to learn about this shocking incident. We extend our sincere sympathies to the families and loved ones of the victims at this tragic time," the movie's producers said in a statement. "The suspect throws tear gas in the air, and as the tear gas appears he started shooting," said Lamar Lane, who was watching the midnight showing of the movie with his brother. "It was very hard to breathe. I told my brother to take cover. It took awhile. I started seeing flashes and screaming, I just saw blood and people yelling and a quick glimpse of the guy who had a gas mask on. I was pushed out. There was chaos, we started running." "We were maybe 20 or 30 minutes into the movie and all you hear, first you smell smoke, everybody thought it was fireworks or something like that, and then you just see people dropping and the gunshots are constant," witness Christ Jones told ABC's Denver affiliate KMGH. "I heard at least 20 to 30 rounds within that minute or two." A man who talked to a couple who was inside the theater told ABC News, "They got up and they started to run through the emergency exit, and that when she turned around, she said all she saw was the guy slowly making his way up the stairs and just firing at people, just picking random people," he said. "The gunshots continued to go on and on and then after we didn't hear anything...we finally got up and there was people bleeding, there was people obviously may have been actually dead or anything, and we just ran up out of there, there was chaos everywhere." Hundreds of police and FBI agents are involved in the investigation. A senior official who is monitoring the situation in Washington said that early guidance based on the early snapshot of this man's background indicated that this act does not appear to be linked to radical terrorism or anything related to Islamic terrorism. Dr. Comilla Sasson, at the University of Colorado Hospital where many of the victims were taken, said they are currently operating on nine critical patients and have treated 22 in all. She called the hospital "an absolutely terrifying scene all night." In a statement, President Obama said, "Michelle and I are shocked and saddened by the horrific and tragic shooting in Colorado. Federal and local law enforcement are still responding, and my administration will do everything that we can to support the people of Aurora in this extraordinarily difficult time. We are committed to bringing whoever was responsible to justice, ensuring the safety of our people, and caring for those who have been wounded." A man who was in the adjacent theater with his son, said that the commotion began as one of the action scenes was starting up. "These guys came through, and they say someone's shooting," he said. "I thought, 'Oh, they must have heard the fireworks, you know ... I had no idea. And then the alarms started to go off in the theater.'" Investigators are now interviewing friends and associates of the suspect to get a sense of the man's background. For continuing coverage on "Tragedy in Colorado: The Batman Massacre," tune in to "World News," "20/20" and "Nightline."